On recently popping into Poundland, I browsed their beauty section, as though you may not think it, sometimes they have some absolute gems. 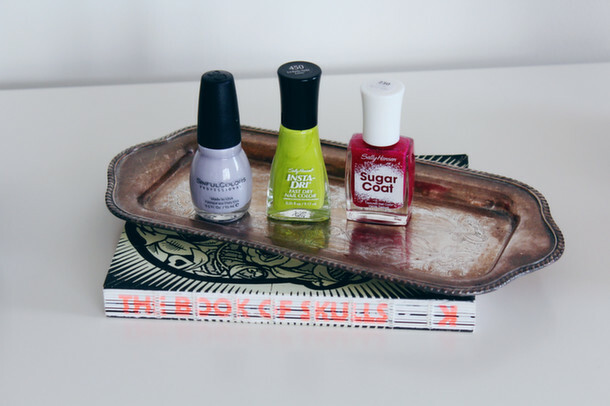 It seems that at the moment, Poundland are as spring polish crazy as we are, and they have a tonne of great shades in there to keep your mani amazing, but your wallet full too. I found three amazing shades that are 100% up my street, and I thought I’d share this mega-find with you. These are all available at the moment in beauty stores online and instore for full price, so I definitely snagged a bargain. First we have Mauve by Sinful Colours. I’ve bought a few of their polishes before from Boots, and have been impressed in the past. This shade is a lovely grey with a purple lean and perfect for spring and summer, especially if neon brights aren’t your thing. This understated shade can instantly be made more magical with a glitter topcoat, you can see the recent mani I created with this over on my Instagram @camilladelacoe, or by clicking here. These are usually £1.99. Next up is Lickety-Split Lime by Sally Hansen. This is just the most amazing formula. It’s thick and creamy and dries shiny like gel. It goes on so smoothly, no bubbles and is opaque in one coat. If I see any more shades in this range I’ll be snapping them up pronto. You can buy this polish in the Superdrug Sally Hansen section, but her polishes get pretty pricey here in the UK, so you can save yourself a bit by heading to Poundland, at least £3 or £4. The shade is super ’90s and you can see how this looked on the nails on my Instagram here. Finally for today is Pink Sprinkle by Sally Hansen, and this is part of the new Sugar Coat collection which is a gritty consistency and dries matte. The colour is great, and you don’t need to put a basecoat on at all, as there is definitely colour beneath the glitter. If you’d like to apply a very thin coat of this however, putting a pink polish underneath will cut down how gritty the texture is. I still haven’t made up my mind about how I feel about the texture, but I can’t deny that it looked great on. You can see this on my nails in an Instagram shot here.